Our second story unit offers POOL VIEW, glimpse at the ocean, mountain view-The Rain Forest. Malibu Beachfront located in the small beachtown of Loiza is a beachfront gated community only 14 miles East of San Juan airport offering: security, electric gate, beach access, THREE swimming pools, gazebo, assigned FREE 2 parking spaces, Wi-Fi and Cable TV. line or a modern expressway only 25 minutes from SJU airport. Away from the noise and hustle of the city but within minutes of shopping malls, golf course, restaurants and world famous tourist attractions. For rent short or long term. International Flight Attendant is my second career after my retirement. I travel every chance I get when I'm not doing it for work. If I don't get right back to you is because I am "up in the air". Town and Country---Close enough to the City to be able enjoy the benefits of urban living, yet far enough to leave the hustle and bustle of the city behind. Beach and pool provide the relax atmosphere exclusive area resorts offer but at a fraction of the cost. Home furnished to make our guests feel like is their home away from home. Nice spot, property well kept. Pool was wonderful and quite lovely. We are glad you enjoyed your stay and I sincerely hope you visit us again in the near future. It was a real pleasure to have you as our guest. 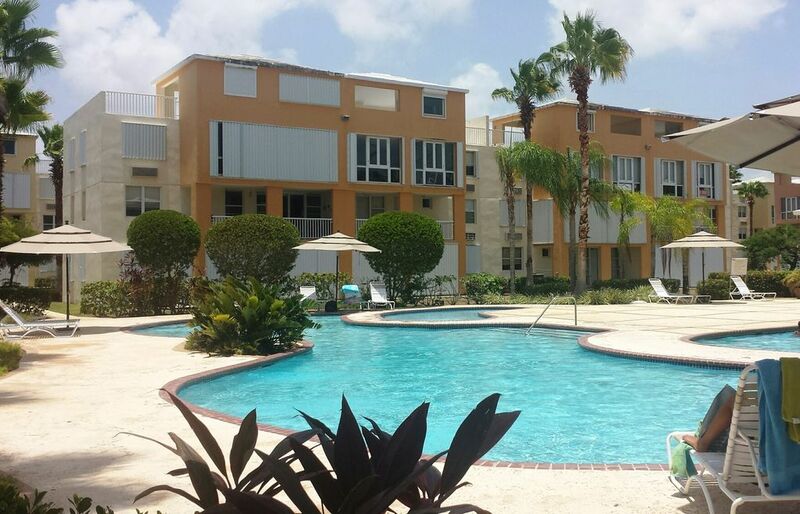 - Malibu is a relatively modest gated condo property in a very poor area of Puerto Rico. While we drove in the neighborhood passing poor and abandoned homes, My 11 y.o. son would say that the streets reminded him of videos of war-torn Iraq. - pool and cabana were nice, and grounds were manicured; iguanas and small lizards sun themselves on the lawn. - on the last night I wanted to make Pina Coladas and saw that the blender does NOT work. It is also dirty on the outside. - on the master bedroom, the cheap dresser has drawers that don't slide properly and one has a bottom that drops when clothes are put in it. - the window blinds in two south-facing rooms were NOT room darkening so that the rooms were hot with the sun coming in and in the mornings the children awoke early because of the brightness. If you want a no-frills inexpensive place and you have low expectations, well you may consider this apartment; if you are expecting a nice, comfortable and presentable vacation apartment, go some place else. While we cannot remedy this traveler’s dissatisfaction with our condo location, we wished he would had allowed us the opportunity to remedy the problems found with our most economical unit. Since we have other rental units in the same complex, we would have gladly upgraded him to a more luxurious unit, which it was offered to him upon receipt of his first and only inquiry. Our units are furnished to accommodate 6 people. For over 6 years we have been opening our vacation homes to families from the US, Canada, Asia, and Europe. They have been very happy to be issued 1 gate key. For safety reasons, this is a controlled key and we are not allowed to make copies. We are sadden by these comments, especially when this particular traveler witnessed firsthand our flexibility, trust and eagerness to service our guests. Upon our meeting at the airport, he notified us he had forgotten the final payment cashier’s check. Without hesitation, we issued the keys to this traveler and allowed him time to make other payment arrangements. Dishwashers are not popular in P.R. We never advertise our units being furnished with dishwashers. Not far from casinos, hotels, golf courses, and other award-winning destinations, you will find the picturesque town of Loiza. Within minutes of entering Loiza, you will notice the humble houses and the rustic living of the friendly and welcoming, mostly black population, which gives the town its mystique. With the unique blend of unspoiled colonial flavor and virgin shorelines, this charmingly small and intrinsically ethnic town is an authentic experience of Puerto Rico's past and present. Within the luxury resort developments and private villas, surrounded by the humble homes in this seemingly incongruous kaleidoscope of wealth, poverty, and magical folklore, you will find Malibu Beachfront. With its unique location you can safely experience the beauty of a sea front paradise, surrounded by the wonderful local people offering excellent home cooked meals and opportunities to shop for regional goods. Before you book, please, do your research, ask questions, let us know of your priorities, special needs, the group composition, the type of vacation you are planning and we will be happy to answer all your questions promptly. Based on our experience and knowledge of the island we can point you to a unit, a complex, a resort, or even a hotel that would best meet your traveling needs. We have family of 5, kids ages 10-13. Our condo had plenty of space for us. Condo had everything that you would need to feel very comfortable (pots, pans, iron, fan, washer, dryer, air conditioner). Maria,lady who rented condo to us, had many useful tips and suggestions on where to go for day trips or just trying local food. WallMart is about 6 miles from there, that's where we did shopping. Pools on property were large and clean. In December there were hardly any people in the complex, we pretty much had pools to ourselves. Condos are gated, it was completely safe inside, we did not even lock our place while there. Access to the beach is right there. Beach is public, so it's not super clean, but it has it's own natural beauty. There is no lunge chairs on the beach but there are chairs in the condo that you can use. There were some waves in December, but we still went for the swim every day, water was very warm in clean. Overall location was great, close to the airport, San Juan, shopping, rain forest. You would need a car to drive everywhere. We are glad you enjoyed your stay. It was a pleasure to have you, your family and friends as guests during the Holidays. In December, during the middle of our "winter", the beach in front of the condo is not at its best, as the waves can be a little rough and the Atlantic ocean brings debris to the shore. But if you visit us in between Mar and August you will notice the natural changes that occur with the change of the season. The water turns into a beautiful blue/green color, the sand turns into an intense golden color, there are hardly any waves and mother nature does not send as much debris to the shore. During the spring/summer months the city government periodically cleans the beach from any debris the tide might bring in. specializing in sea food dishes such as crab meat and lobster tacos. We provide self-check-in... which means you can check in at what ever time is convenient to YOU!